This giveaway is now closed Happy Friday everyone! Just saying the word Friday makes this girl grin a bit. Love the look of a great weekend laying right out in front of me. Hope you have some fun plans! I’ve got a fabulous recipe and giveaway for you today. I recently received a copy of My Southern Food a wonderful cookbook written by Devon O’Day. This book is beautiful, and full of classic southern recipes. Corn Bread, Chicken and Dumplings, Biscuits and Red Velvet Cake are just a few of the tasty creations represented in the book. 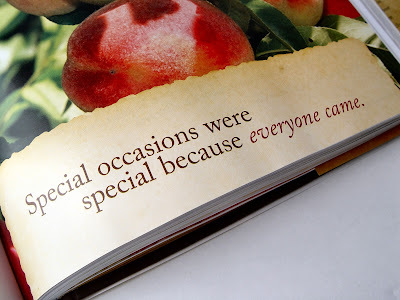 Not only is the book full of great recipes, but there are endearing little quotes tucked here and there along the pages. I felt like I was taking a little trip to the south when I read through it. 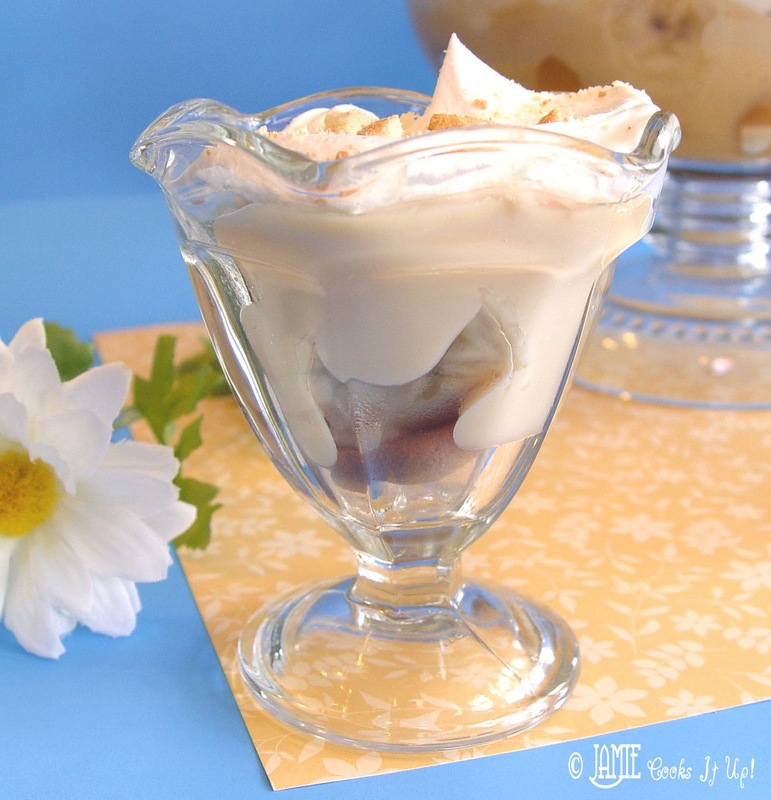 (“Good Ol’ Nanner Puddin’ ” is what it is actually called in the book!) really caught my eye. 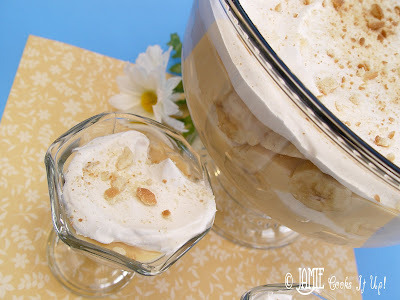 I have a good friend who makes a Banana Pudding that is truly to die for. And bananas, aren’t really even my favorite thing! I usually go for something smothered in chocolate, truly. But my friends Banana Pudding…..it’s Magically Delicious. This nice friend of mine will not part with the recipe. And who am I to ask him to break an oath like that! It was! Oh….it really was. I bet you will think so, too. The Thomas Nelson Publishing Company would love to send one of these cookbooks to THREE of you lucky readers. To enter the giveaway leave me a comment telling me what your favorite “comfort food” is. PLEASE leave your email address with your comment. You may enter from now until Tuesday March 29th at midnight. The three lucky winners will be chosen at random and announced on Wednesday March 30th. 1. Pour canned milk into a large measuring cup making sure that you have 4 Cups total. This works out to be just a little bit less than three 12 oz cans. 2. Pour 3 C of the canned milk into a medium sized sauce pan. and the sugar. Whisk it all around until nice and smooth. 4. Bring the milk in the sauce pan to a boil over medium heat. Add the milk/sugar mixture to the boiling milk and stir constantly as the pudding starts to thicken. This should take about 5-8 minutes. 5. Reduce the heat and add the butter and vanilla. Continue cooking until the pudding is thick. (This took about 8 more minutes of cooking and stirring.) Set the pudding aside and let it cool to room temperature. 6. In a large glass bowl, or trifle dish lay out about half of your vanilla wafers. 7. Cover with half of your bananas, nanners. 8. Pour half of the pudding over the top and cover with half of the Cool Whip. Repeat the layers. Crumble a few vanilla wafers over the top of the dessert if you choose. 9. Chill for at least 4 hours before serving. Enjoy! Thanks to Devon O’Day and Thomas Nelson Publishing for a wonderful book! Growing up my mom always made banana puddin for her three girls. It was one of our favorites. I am looking forward to trying this receipe. For me the best comfort food in the world is homemade soup. Especially my very dear friend Margery's Tortilla Soup. My comfort food is a hot chocolate chip cookie with a dollop of ice cream on top…Mmmm! Love your blog!! Just discovered your blog. Love the recipes. My comfort food is bread with anything like butter and jam or cheese. This pudding makes me hungry for my favorite comfort food…..RICE PUDDING. LOVE THE STUFF. I love a good buttery, flaky, biscuit with potatoes and onions. my husband doesn't like chocolate so i'm always trying to find yummy “non chocolate” recipes! i'm excited to try this!! my comfort food… probably spinach/artichoke dip!! yum! YUM! Everything on your blog always looks amazing! My favorite comfort food would have to be scalloped potatoes and ham. My Mom made this for me both times I came home from the hospital with my daughters. The memories are priceless. Chicken and dumplings is definitely near the top of the list. I enjoy reading your blog. I just love potroast with mashed potatoes and gravy. There is nothing like this on a cool evening or just because. My favorite comfort food is Biscuits and Gravy. Yum! My favorite comfort food would have to be a grilled cheese sandwich with tomato soup or mashed potatoes and gravy. I would have to say my favorite is Biscuits and gravy, but my family doesn't like it. So I just keep on trying to make different kinds of fried chicken with potatoes and gravy. YUMMY!!! Home made mac and cheese has to be one of my favorite comfort foods (and now one of my son's). Right next to chicken and stuffing 🙂 Love your blog! My favorite comfort food is chicken and noodles. Mashed Potatoes, all the way. My favorite comfort food is roast beef with mashed potatoes and gravy. Yum!! I would say any kind of cheese…. love the good creamy cheese! Whoo-hoo. I'm so excited to get a copy of this book. A friend of the family comes over twice a week. Her favorite thing to eat, bananas. I'm going to surprise her with this pudding. Devin I love your recipes! I actually make my own good ole Nanna Puddin that my Nanny taught me how to make since I was about 7 back home in Texas & I'm not a huge fan of bananas but I do eat it but only while it is warm. As for my favorite comfort food..it's a toss up between my homemade creole gumbo or good ole fried chicken & mashed potatoes with homemade strawberry shortcake for dessert! YUM! Hi. Just a quick note to let you know I haven't received the book yet. I sent my address to two different emails – did you get it? I got your address sent of a while ago, just heard back on Monday from the publishing company…they said they would be sending it right out. Let me know in the next few days if you don't receive it and I'll contact them again. Thanks!